Wow!! 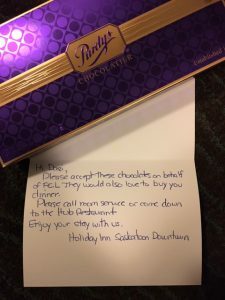 After a long, busy day at home, I checked into the Holiday inn in Saskatoon and received a personal note, a box of chocolates and supper bought for me all from FCL. FCL is all about creating the customer experience — imagine the first impression they have left on me! Thank you FCL for choosing me and treating me so kindly — before I even get to the event.